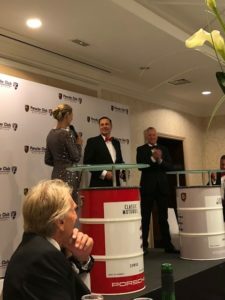 At a glittering awards ceremony in Stratford upon Avon on Friday 21st September, with guest of honour five times Le Mans winner and Porsche racing legend Derek Bell MBE, Rob was awarded Honorary Membership for life by Porsche Club GB. Rob was announced as the youngest person to ever receive this award. The award was presented by motor racing TV favourite Louise Goodman in recognition of Rob’s contribution which included a four year stint on the Club’s Board of Directors from 2014 to 2018, two of which where Rob was Chairman. During that time, the Club increased in membership size from 12,000 to 21,000 and turnover doubled, a trajectory that continues. Rob has thoroughly enjoyed the time he spent at the heart of the country’s largest car club and has benefited from working with industry leaders, both nationally and internationally, to bring a level of business acumen to Kellocks that a criminal defence specialist would not ordinarily enjoy. Rob’s passion for Porsche is complemented by his keen interest in motoring law generally and anybody who faces investigation or prosecution in relation to motoring related allegations should not hesitate to give him a call or email him directly at rob@kellocks.com.